To provide a forum for sharing innovative methods and how to use the arts in teaching and disseminating these methods nationally and internationally. To furnish published materials that provide teaching strategies and activities incorporating the arts into the classroom curriculum. To develop collaborative relationships with arts and education-based organizations. To recognize teachers who effectively use the arts in their classroom programs to teach children who learn differently. To develop and conduct art education programs for pre-school children to introduce the arts into their early educational experience. 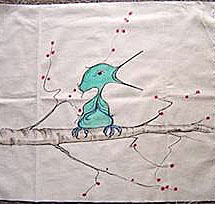 P. Buckley Moss, or Pat, was a student who did not benefit from traditional education methods because of dyslexia. Dyslexia, as defined by the Oxford Dictionary, is "a general term for disorders that involve difficulty in learning to read or interpret words, letters and other symbols, but that do not affect general intelligence". Gifted, but unable to read, she was readily passed through the school system with a bare minimum of education. Pat's story and her love for children led to the formation of the Foundation in 1995. Several dedicated members of the P. Buckley Moss Society laid out the framework for the Foundation and established two scholarships. The Judith Cary Leadership Memorial Scholarship was created in 1999. It was awarded to a student who is working either full time or part time toward special needs certification or an undergraduate or graduate degree in some field of Special Education. For many years, Judy Cary was an enthusiastic teacher and leader with the society. 2017 was the final year of funding for this scholarship. The Anne and Matt Harbison Scholarship was awarded to a high school senior with a certified learning difference who was pursuing post secondary education. Anne Harbison is considered to be the founder of the Moss Society and it's first president. She was an ardent supporter of Pat's early charitable endeavors. Currently, the Foundation's Board of Directors administers the P. Buckley Moss Endowed Scholarship annually for learning-different students who have an artistic talent to pursue education in the arts. Assistance, through grants, is also provided for teachers developing and implementing art programs. The Foundation raises money for the scholarships through donations provided by members of the P. Buckley Moss Society, their Chapters and various fundraisers. Pat donates her art in the form of limited edition prints and unique original art to be sold to generate funds for the scholarships. 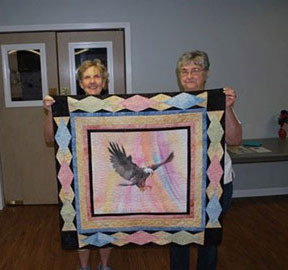 Pat paints fabric squares that become the centerpieces for quilts and special quilted wall hangings that are quilted by Society members and auctioned off by the Society and Foundation. The proceeds from the auctions benefit the P. Buckley Moss Foundation for Children's Education, Ronald McDonald Houses, and the P. Buckley Moss Endowed Scholarship. 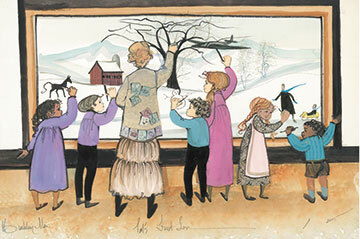 Pat's First Love, painted by Pat for the P. Buckley Moss Foundation for Children's Education. Both art and children jockey for position as Pat's first love. Here Pat has painted herself (in an outfit familiar to many) indulging one of her favorite pastimes, painting with children. 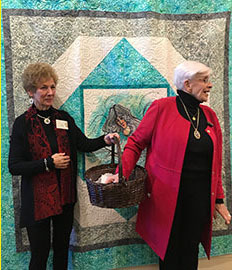 Pat Moss is noted for her charitable endeavors, one of which is the education of children. She believes art in all of its forms must be an integral part of the curriculum, especially to help children with learning differences succeed in school. Pat has actively promoted educational programs in the USA, Japan and Panama. Thus, the Foundation exists specifically to encourage using the visual and performing arts in all educational programs, but especially in those programs involving children who learn differently. 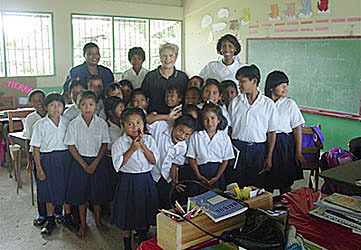 Here's a photo from 2002 of Pat's visit to Virginia Vasquez and her students in Panama.